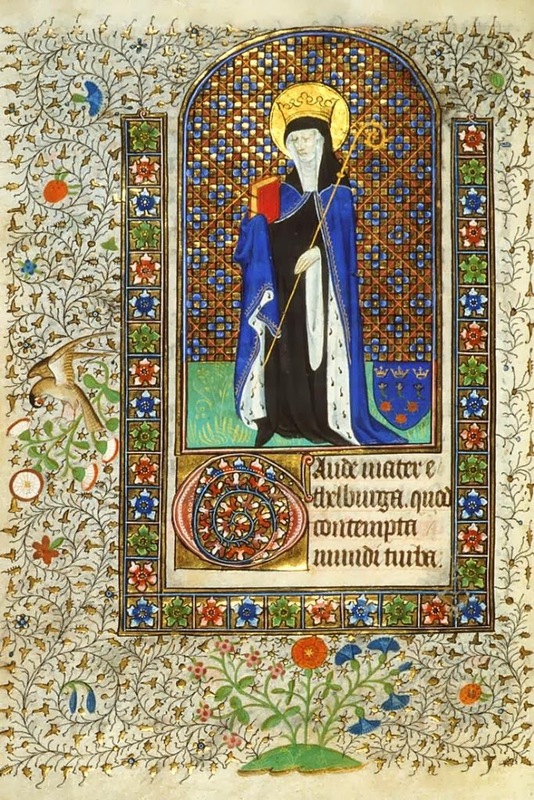 "When Ethelberga, the pious mother of that holy congregation, was about to be taken out of this world, a wonderful vision appeared to one of the sisters, called Tortgith; who, having lived many years in that monastery, always endeavored, in all humility and sincerity, to serve God, and took care to assist the same mother in keeping up regular discipline, by instructing and reproving the younger ones. Now, in order that her virtue might be perfected in affliction, according to the apostle, she was suddenly seized with a most grievous distemper, under which, through the good providence of our Redeemer, she suffered very much for the space of nine years; to the end, that whatever stain of vice remained amidst her virtues, either through ignorance or neglect, might all be eradicated by the fire of long tribulation. This person, going out of her chamber one night, just at the first dawn of the day, plainly saw as it were a human body, which was brighter than the sun, wrapped up in a sheet, and lifted up on high, being taken out of the house in which the sisters used to reside. Then looking earnestly to see what it was that drew up the glorious body which she beheld, she perceived it was drawn up as it were by cords brighter than gold, until, entering into the open heavens, it could no longer be seen by her. Reflecting on this vision, she made no doubt that some one of the society would soon die, and her soul be lifted up to heaven by her good works as it were by golden cords, which accordingly happened; for a few days after, the beloved of God, Ethelberga, mother of that society, was delivered out of the prison of the flesh; and her life is known to have been such that no person who knew her ought to question but that the heavenly kingdom was open to her, when she departed from this world. There was also, in the same monastery, a certain nun, of noble worldly origin, and much nobler in the love of the world to come; who had, for many years, been so disabled in all her body, that she could not move a single limb. 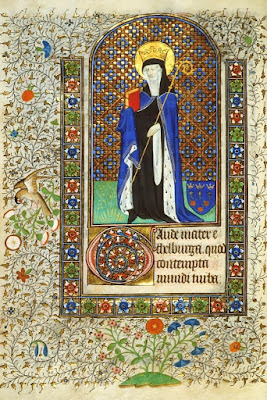 Being informed that the venerable abbess's body was carried into the church, till it could be buried, she desired to be carried thither, and to be bowed down towards it, after the manner of one praying; which being done, she spoke to her as if she had been living, and entreated her that she would obtain of the mercy of our compassionate Creator, that she might be delivered from such great and lasting pains; nor was it long before her prayer was heard: for being taken out of the flesh twelve days after she exchanged her temporal afflictions for an eternal reward. Three years after the death of this lady, the aforementioned servant of Christ, Tortgith, was so far spent with the distemper before mentioned, that her bones would scarcely hang together; and, at last, when the time of her dissolution was at hand, she not only lost the use of her other limbs, but also of her tongue; which having continued three days and as many nights, she was, on a sudden, relieved by a spiritual vision, opened her mouth and eyes, and looking up to heaven, began thus to direct her discourse to the vision which she saw: 'Your coming is very acceptable to me, and you are welcome!' Having so said, she was silent awhile, as it were, waiting for the answer of the person she saw and spoke to; then, as if displeased, she said, 'I am not pleased with this;' then pausing awhile, she said again, 'If it cannot be today, I beg the delay may not be long;' and again holding her peace for a short while, she concluded thus: 'If it is positively so decreed, and the resolution cannot be altered, I beg that it may be no longer deferred than this next night.' Having so said, and being asked by those about her to whom she talked, she said, 'With my most dear mother, Ethelberga;' by which they understood, that she was come to acquaint her that the time of her departure was at hand; for, as she had desired, after one day and night, she was delivered from the bonds and infirmity of the flesh, and entered the joys of eternal salvation." Ethelburga founded the church of All Hallows Berkyngechirche (now known as All Hallows Barking or All Hallows by the Tower) in the City of London on land given to her by her brother Eorconwald c. 675. This Saint Ethelburga should not be confused with another saint of the same name (Apr. 5), who was married to the holy martyred King Edwin of Northumbria (Oct. 12).